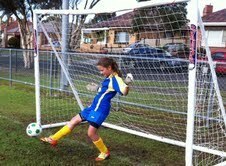 What a great game from the u/9 Blue girls this week. They played the Yarra Jets red team at home and all the girls played an amazing game with some fantastic team work and some really promising ball skills and passing. Thank you to our goalies Freya and Sammi for your performances. What an entertaining game today against the Barnies!! It had a bit of everything - coming back from a goal down, an outstanding goal-keeping display from Merina in the first half that kept us in the game, some beautiful passing and combinations (first time this year really) that resulted in 5 excellent goals (well done all the midfielders and forwards), a superb debut from our new player Cate that almost included a goal, a starring performance from Honor with 2 goals (the other team's coach was talking about her as 'that girl' after the game..), bravery (Mia's effort to keep playing after taking a hard ball right in the stomach), and even a little bit of controversy with the coach playing most of the second half with 10 players on the pitch, and finally some wonderful sportsmanship from the other team who accepted our apology with great generosity and grace. I was very proud of every girl today for their performance as each one showed improvement in areas we had spoken about during training and before the game. It was great to see the team fighting so hard to win the ball and starting to really work together as a team - as seen in the entertaining quality of the game and the final result. Brilliant girls. Can't wait for the rest of the season...See you down at training - even in the rain. Rest week next weekend - enjoy. The Kangas travelled to Ardeer to play Westgate FC and came away with a 2-1 win. We lent them a player in the second half as they did not have any subs - thanks April for stepping up and putting in a great showing. Our first half was as strong as ever with Isobel leading from centre mid and scoring the only goal of the half. Our defence held solid as ever with one small lapse to make it 1-1 soon after half-time. Most of the second half we played in their half of the field and then Bjan scored a wonderful goal into the top right corner to put us in front. Great effort from everyone as always and thanks to all the supporters too. Well the Under 18 gad a good win against Satellity city. It was cold, and wet but the girls played very well. 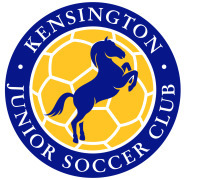 They continue to improve and show excellent soccer skills and actions. Wonderful passing and wonderful team play.